Kathy's outfit for her second daughter's wedding is champagne colored with pretty little pearl beads around the neck area. 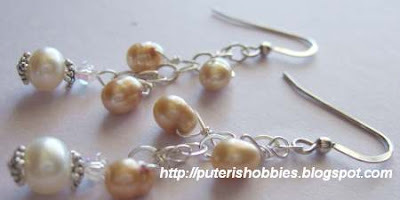 I made this white pearl and champagne colored pearl dangle ear-rings to go with her outfit. The findings are sterling silver. 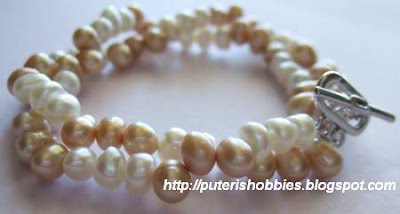 This two-strand two-toned pearl bracelet completes the mother of the bride outfit. To go with the ear-rings and bracelet Kathy is wearing a white pearl necklace which she got from her eldest daughter. This is sooo gorgeous! I am going to have my wedding at end Nov. I love to have a pair of pearl ear rings! Hey lady, whats ur etsy shop site? cepat cepat tell me! No need to wait for the etsy shop to open lah, Kitman. Just tempah and I will make! I can make a few samples and you choose which design you like best! That was what I did for Kathy's daughter's bridesmaids. I made about five different pairs of ear-rings and they chose one for the bridesmaids to wear.